Cutting It Down to Size: Derrick Barge Removal - Global Diving & Salvage, Inc. In Spring of 2017, high winds from a storm sank an unmanned derrick barge overnight while it was moored off Yerba Buena Island in San Francisco Bay. The 111’x52’x10’ derrick barge, weighing approximately 875 short tons, settled on the seafloor; the vessel came to rest on 25’ to 30’ of compacted sediment above the BART tube that runs underneath the bay and adjacent to a shipping channel. Spill response crews surrounded the vessel with more than 3,000 feet of containment boom and the US Coast Guard San Francisco Sector established a safety zone around the site. 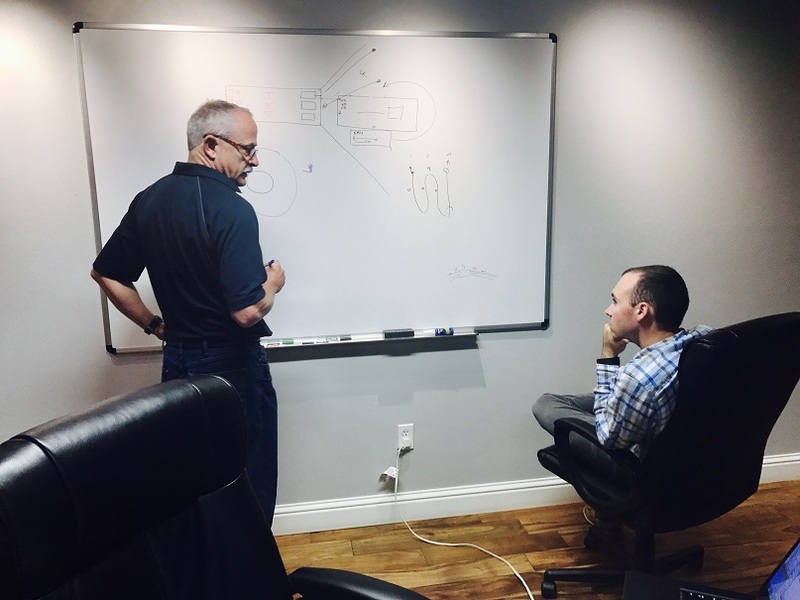 Global’s marine casualty team met with the owner and other involved parties to discuss options and determine the best plan of action. It was decided to approach the salvage in two stages: first, parbuckle and defuel the vessel to remove the pollution risk, and second, lift and remove the vessel. Global’s divers conducted an initial survey of the vessel and plugged any vents leaking fuel and oil. An E-Track sonar scan and physical inspection by BART crews showed the tunnel was not impacted by the wreck. Sonar scans were also performed on the vessel’s position on the seafloor to determine available options for parbuckling and removal. Initial scans showed the barge was sinking several inches per day into the sediment above the BART tube, but once the mud underneath compacted the settling slowed, then stopped. When the barge sank, it came to rest on top of its crane and pedestal. Conflicting records made it unclear if the 275-ton crane and boom was physically attached to the 600-ton barge or gravity-mounted on the track. Because of its position under the vessel, sonar scans and diver inspections did not provide a clear indication of attachment. Global’s salvage team was obligated to work under the “worst case scenario” and assume the crane was attached, calculating 280-tons of horizontal pull needed to parbuckle the vessel. 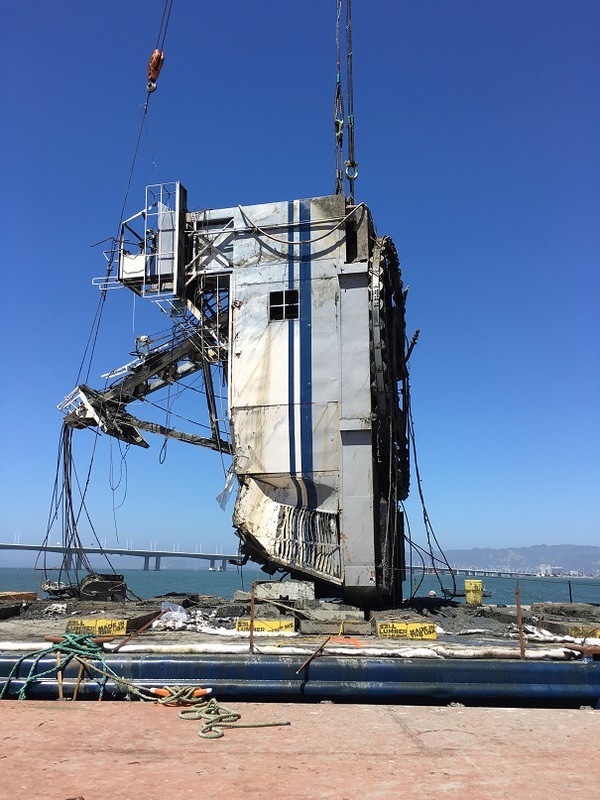 Global subcontracted the DB Mare Island from CS Marine Construction for use as the dive barge; prior to parbuckling its crane was used to remove the sunken barge’s four anchors and dive station container, eliminating fouling hazards. Curtin Maritime’s 214 deck barge was outfitted for pulling during the parbuckle; equipment included anchor winches, strand jacks, salvage anchors, and thousands of feet of cable. As the topside crew configured the complex array of anchors and winches, the divers rigged the casualty for parbuckling. Safety concerns required the crew perform the parbuckle after BART traffic had stopped for the evening; once given the all clear, righting operations commenced. The crew was able to monitor the progress of the parbuckle in real time using live sonar images. After sufficient force was used, the sunken derrick barge rolled upright; the crane and boom detached from its pedestal and remained on the seafloor. Crews demobilized the 214 barge and performed another round of sonar surveys to assist in determining vessel removal options. Divers used a pollution dome to pump out approximately 2,450 gallons of fuel and oil into portable storage tanks for disposal ashore. Global’s salvage experts and the parties involved weighed several options for safe vessel removal, including refloating and tandem crane picks. The wreck was still resting above the BART tube, and its weight prevented it from being lifted in one piece by any derrick barge available on the West Coast. The team decided the safest option was to cut the steel vessel in half with exothermic torches, then lift the two halves and the crane individually. With cutting operations underway, General Construction’s DB General, a 700-ton capacity crane barge, mobilized from Seattle to perform the heavy lifts. Once the wreck’s hull was cut in half, the team used two small barges to pull the halves a few feet apart confirming they were no longer connected, eliminating the risk of extra weight bogging down the DB General during the lift or the pieces snapping apart and impacting the BART tube. 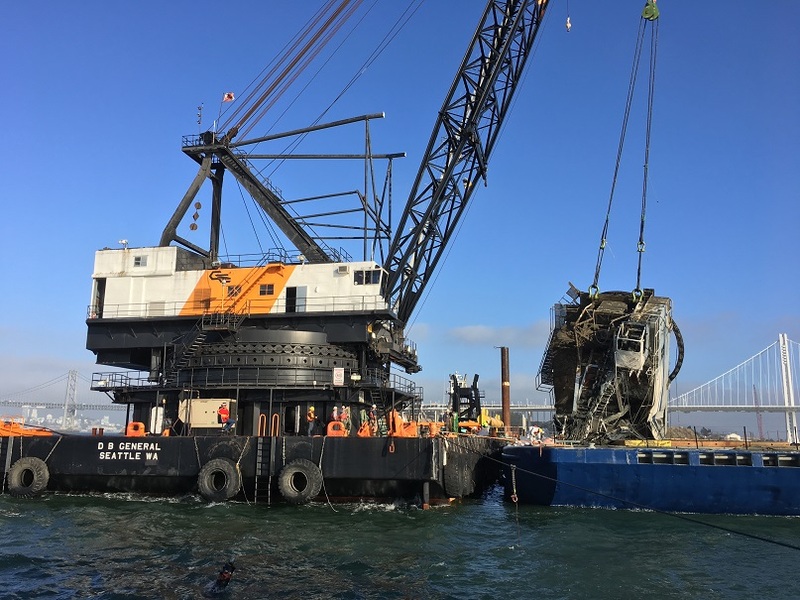 Once the DB General was in position, the crews recovered the sunken barge’s 200-ton crane section first, again operating at night after BART traffic had ceased. The lift required 275-tons of pressure to break the crane from the mud’s suction. Once at the surface, the crane was placed on a materials barge and all remaining hydraulic fluid and diesel was contained. The 310-ton stern section was lifted and placed on a materials barge without incident. The team attempted to lift the bow but it became clear the rigging was insufficient for the weight and an all-stop was called. After surveying the situation, the crew designed, purchased and installed a new rigging package in just 5 days. I-beams were welded underneath the deck for reinforcement, and the lift was attempted again. Using 300-tons of force the bow section finally broke free of the mud and was placed on the materials barge. Upon inspection it was determined that the bow, estimated to weigh 290 tons according to the vessel’s plans, contained an additional 145 tons of concrete ballast that was unaccounted for. After all three main sections of the vessel were removed, E-Track conducted another sonar survey of the seafloor to locate tires, an air compressor, and other materials that were on the vessel when it sank. Divers recovered the items and the area was cleared of all navigational hazards. Over the course of the project, the crew safely performed more than 290 dives. “One of the biggest challenges was the 2-3 knot currents and tide cycles in the area that limited dive time to a maximum of 10 hours per day. 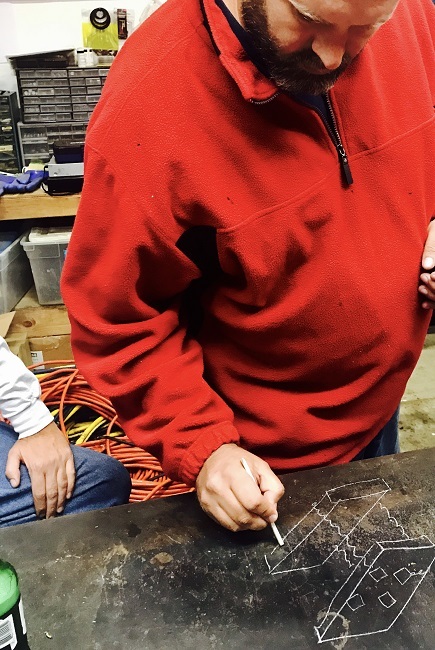 The dive crews could only work for short periods, then we spent the rest of the time planning and working on equipment,” said Kyle Watson, Global Salvage Master.